Use TB2VKPE to reference this item. The goal of this coin is to spread the message of Bike Awareness while travelling from cache to cache through Europe. This coin has been released as part of the Bike Awareness Project. It is a project initiated by USA geocacher Rockin Roddy in response to the death of his dear friend and caching companion Tod Phillips who was cut off by a left turning vehicle too much in a hurry to notice oncoming traffic. Tod was the 3rd member of Team Rod & Tod w/KAboom. Tod died on August 12 2008. Speeding, inattention, inexperience, fatigue, drugs and alcohol and illegal manoeuvres are given reasons for causing accidents. YOU have the power to do something to control each of these factors. Give a good example while driving/riding your self. Practice what you have learned in your driving lessons. Drive save and watch for the more vulnerable travic participants. Start a discussion and make people aware they can help save lives to keep to the rules, be alert and drive save. 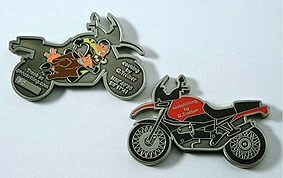 Nearly 900 geocoins, with the message of Bike Awareness are travelling for the Todie’s Wild Ride now.